Jitendra's Blog: Numismatics Meets QR Codes - Dutch coins with QR codes! Numismatics Meets QR Codes - Dutch coins with QR codes! QR codes (Quick Response codes) were designed by Toyota for use in their systems to encode and decode bulk information at higher speeds. Due to their large storage capacity and quick readability they were adopted by other industries across the world and in a short span of time we started seeing QR codes for almost every product we use, from mobile companies to apparel brands to personal profiles on social networks. In fact, the QR code decoder apps are available for mobile and smart-phones, so people can decode QR codes themselves. However, no country has ever embodied QR codes on their coins or paper notes. 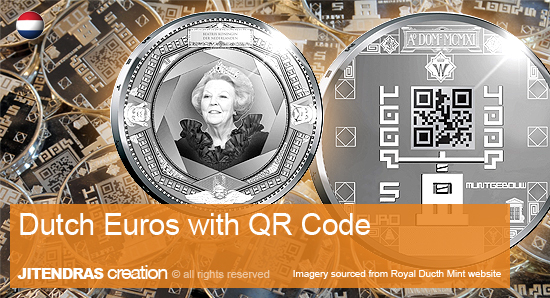 The first time ever, Netherlands' Royal Dutch Mint has produced coins with QR codes embodied. Occasion is the 100th anniversary of the Royal Mint. They are producing silver and gold coins of €5 and €10. of our nowadays living. Nowadays we live in a world in which technology and communications changed the way we think and the way we have relations. A world where internet is present in our daily lives. A world where the “master and apprentice” concept of transmission of knowledge is changing, due to the great source and amount of information available in internet. A world where the coins are not hammered anymore, but engraved with laser technology. A world of QR codes, augmented reality, internet, screens, lasers and mobile phones. A world with a fifth element in nature: instant communication. The QR code on the coins when decoded directs to this website. If you collect coins, this is for you. Shop and book one before its out-of-stock.